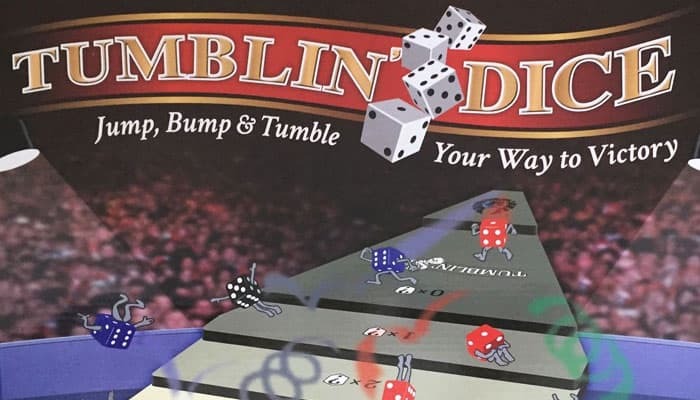 A dexterity dice game consisting of four sets of colored dice one either slides, rolls, or flicks down a stepped surface. Usually one slides the die for better accuracy. 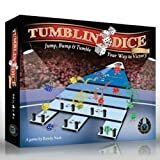 After each person has slid their 4 dice, points are scored. You score the die roll times a multiplier of either 1×, 2×, 3×, or 4× depending on which area of the board the die is on. (Dice which land in the 0× region are immediately removed from play). High scoring rolls are targets for opponents. Four rounds are played and the player with the most points win. 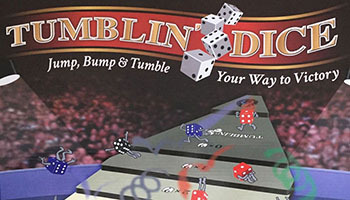 Tumblin-Dice Jr. is the "travel" version. The 2008 edition from Ferti Games states is for 2-6 players. You will also need a pencil and a sheet of paper (which are not provided). Be the player to score the most points in four rounds of play. If any players are tied after four rounds, then those players will play an extra round or rounds until a winner is determined. Setup: Players place printed playing-cards on the board to trigger various events, ranging from dice teleportation to exploding dice! Place two "Magic Gates" on the board. If a die lands on one of these gates, that die is automatically teleported to the matching magic-gate.